Rabbi Yitzhak Yosef says death penalty to terrorists law is against halakha, would endanger Jews. 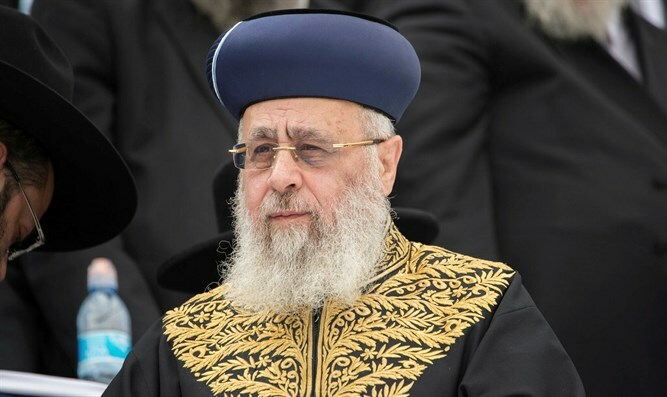 The Chief Sephardic Rabbi of Israel, Rabbi Yitzhak Yosef, on Saturday night spoke out against the death penalty for terrorists law being promoted by Defense Minister Avigdor Liberman (Yisrael Beytenu). According to the Kikar Shabbat website, Rabbi Yosef warned in his weekly shiur (Torah lesson) that if the law is approved, it would endanger Jews, not just in Israel but around the world as well, as it would mean that Jews who carried out terrorist attacks would also be put to death, which would be against halakha (Jewish law). "If there was a law stipulating capital punishment, then what would have to be the sentence of that Jew who burned [Arabs in Duma]? He would have to be sentenced to death, he deserves death, but death by heaven. Let him catch a disease or be involved in a car accident, but can you kill him? Are we the Sanhedrin?” said the Rabbi, who also expressed concern over what the reactions to the death penalty in Israel would be around the world. "From the verdict to the execution, what kind of noise will there be in the world? The Jews in France, Spain, everywhere - will be in danger," he warned. Rabbi Yosef also mentioned the opposition of the defense establishment to the proposed legislation. "All the security people say that there is not much point in this. That's why the great sages, the real ones, were always against this law, it's not about left or right, it's connected to the judgment of a great rabbi." The law imposing death penalty on terrorists was approved in a preliminary reading last Wednesday by a majority of 52 to 49.